Ads in the subway say that I can now buy lottery products from my government online! Woo hoo!. Lotteries are awful and more generally general government revenue from gambling is a sickness. No one would think that a tax that charged random amounts to random members of the population with a specific emphasis on the poor and the uneducated was a good idea, and government-run gambling is indistinguishable from that. But what I want to talk about is the ads themselves. 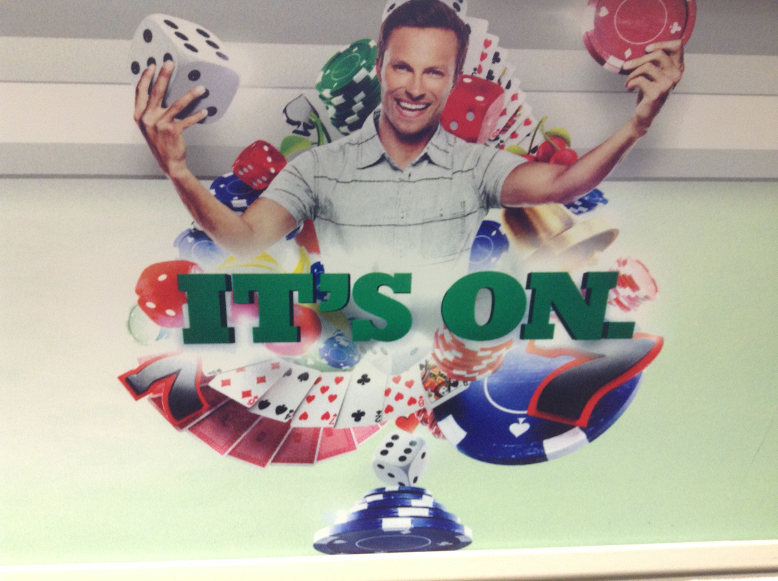 A happy looking man stands in the middle of a variety of gambling paraphernalia like playing cards, dice and poker chips. The cards are fanned out around him like a streamer, the dice are rolling on all sides, he is having a good time. Now, it appears to be an entire deck of cards, maybe several, in random order. But as the streamer goes around him, of course, some of it is directly in front of him. The first time I looked at the ad, my brain parsed five of the cards as "his hand" because of their placement in the image. Sure, there are other cards nearby, but those ones just jumped out at me as the five cards that were laid out in front of him. And what are those cards? A two, a four, a five, a seven and an eight of a variety of suits. I honestly don't think this could possibly have been on purpose. I'm not even sure if other people would have the same reaction as I did and pick those cards out of the image as his cards. If everyone does have that reaction, and if it was intentional, then the image designer is some kind of mad genius of manipulation. I think that maybe it's because I don't think it was intentional that I find it so tragicomic. Somewhere out there some morons who can't get their head around the idea that a dollar is a dollar, who can't imagine what's wrong with governments creating incentives for people to harm themselves, also don't realize they've inadvertently created an iconic image of a problem gambler - a man who is thrilled to have a gutshot straight.